Wayne Madsen said Derbyshire weren’t ruthless enough as they exited the Royal London Cup to Durham. 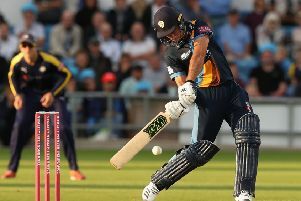 Madsen said: “We were brilliant for the first 40 overs of their innings and poor for the last ten. “We are not ruthless enough. It’s all about momentum when you get to the back end of an innings and Durham had it for their last ten overs then took it into our innings. “It was a bit of a tough surface and 220 would have been a realistic target to chase.